There is an incredibly positive initiative that Walt Disney World has been undertaking, quietly for the most part, for the more than twenty years. Its goal doesn’t include public exposure of itself, though raising awareness about its message is a must, and it goes about its business day-in and day-out in as subtle a way as it can muster. Today, I want to shine the spotlight on Disney Harvest. 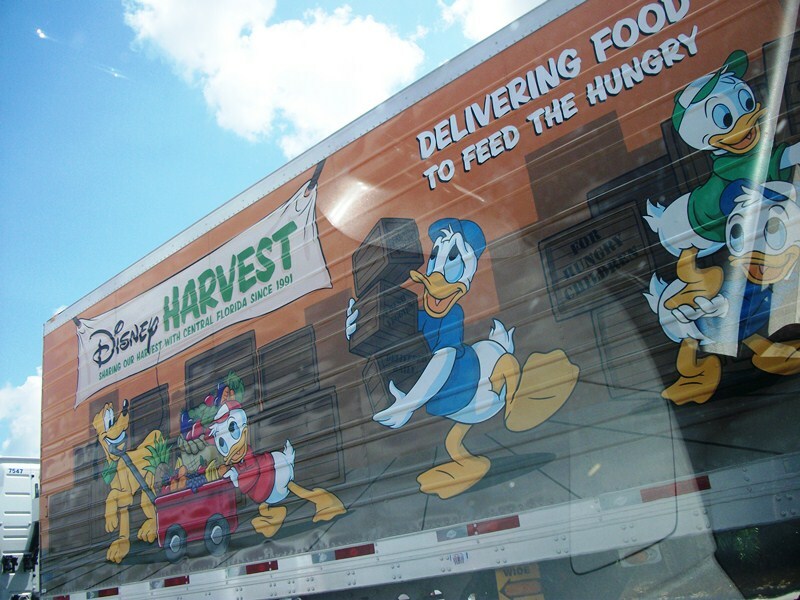 This truck, designed in 2006, shuttles food from all around Walt Disney World. However, it isn’t filling the pantries of Boma or stocking up Casey’s Corner with hot dogs. No, instead this truck picks up the prepared foods that have gone unserved and delivers them to a local agencies that provide meals for those in need. The program, a partnership with Second Harvest Food Bank of Central Florida, began in 1991. The program has regularly delivered enough food to supply 1,000 children a week with something to eat. With the need to create healthier diets, Disney Harvest has pledged to provide 20,000 pounds of fruits and vegetables in 2012. Pair that with the 360,000 pounds supplied by Disney Harvest in 2010, and you have the beginnings of something special. While that may sound like a lot, it is merely a drop in the bucket compared to the actual need of children and families in Central Florida. Walt Disney World has delved into many social issues concerning the health and well-being of youths living in Florida. From after school activities to dietary habits and beyond into mentoring and community involvement, Walt Disney World has realized that the children are our hope for a better tomorrow, which means that they need support for brighter todays. It is tough to focus on the study mathematics, languages, or sciences when your stomach is cramping from hunger pains. Thankfully, there are organizations like Second Harvest Food Bank and Disney Harvest that recognize a strong, well-feed body creates a powerful tool in the mind of a young student. I do not foresee a day when Disney Harvest is not needed, and I am thrilled that Walt Disney World has chosen to make use their surplus meals as a positive tool rather than tossing them in a waste bin, but I don’t see that day coming in the near future. However, if initiatives like Disney Harvest continue to build and thrive, I can foresee a day when no child ventures off to school hungry or goes to sleep with the sound of their stomach growling. Disney Harvest may not be a common name in your household, and you may have never even seen this truck ambling around Walt Disney World, but that doesn’t mean that their good deed and stewardship should go unnoticed.